Joe Jagger scored twice as Littletown beat Toller 4-2. 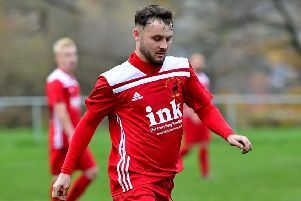 Littletown kept alive their faint hopes of catching West Riding County Amateur League Premier Division leaders Golcar United as they won 4-2 away to Toller last Saturday. Goals from Luke Hepton and Shoaib Mohammed helped Toller go into the break level at 2-2 before Littletown upped the tempo to secure a 12th win of the season. Joe Jagger bagged a brace, with Matthew Addy and Michael Halessellasie also netting to complete the win. Golcar won 4-0 away to Lepton Highlanders and remain clear at the top. Littletown remain fourth, 13 points behind Golcar but with three games in hand and the sides still have to meet at Beck Lane on April 13 in what could prove a key fixture in the title race. Littletown still have plenty to play for as they are also through to two semi-finals. They meet Hartshead in the Wheatley Cup semi-final at Liversedge on Thursday April 11 and are back at Clayborn on April 24 when they face Lower Hopton in the County Amateur League Premier Division Cup semi-final. Hopton lie fifth in the Premier Division table after they earned a 12th win of the season, defeating PFC 7-2. Lower Hopton led 3-1 at half-time and although Mohammed Zubair Khan and Ben Miller netted for the home side, they went on to earn a comfortable victory. Kyle Watson led the way with a hat-trick, Liam Royal bagged a brace, with Arron Kennedy and Akeem Campbell completing the tally.